I have been travelling with my husband across Europe for three years now. Last year, I also received my 200-hour yoga teaching certificate in Santorini, Greece, and it was one of the best experiences of my life. I started doing yoga through online classes. On the internet, you can find a ton of great websites that give you all kinds of styles and sequences to practice. Practicing this way, I found a bit of everything I was looking for, and could do it whenever I wanted. I enjoy Vinyasa classes the most, but am always open to try anything: from Hatha, to Iyengar, to Bikram. I think I have tried almost every style of class, and love them all. Because I practiced on my own, however, I was still missing the feeling of the classroom setting. I wanted to meet yogis and yoginis all over the world and attend different styles of classes. 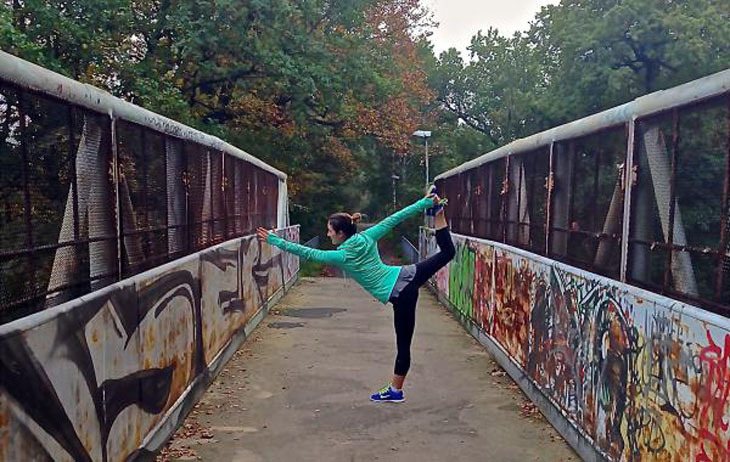 My yoga adventure began in Austria. It took me a couple of weeks to get a good recommendation, but I found a nice yoga studio in the small town we were living in and decided to register. This yoga studio taught classes in English and (obviously) German. I decided to try an Intermediate Vinyasa English class first, only because I was so excited to actually attend a yoga class that didn’t take place in my living room. The class was fun, and I eventually gathered enough courage to attend a German class. I only knew a couple of words in German at the time, and was able to talk my husband into coming to class with me. We were quite lost for most of the class, but we had a blast. It was a lot of fun to see how the German teacher would teach and explain yoga poses and movements. My second destination was Denmark, where although I was even more unfamiliar with the Danish language, I had managed to attend Hatha, Vinyasa, Bikram, and Iyengar classes by the end of our stay, all in different studios. Luckily in Denmark, most people can speak English. I started attending only English classes, but eventually got the courage to attend Danish classes as well. I got to meet many different students and teachers. Bikram was the most difficult because of how fast the teachers would explain each asana. Still, I loved the feeling of exhilaration I would get after every class, and enjoyed meeting people that had a lot in common with me, and who shared a love for yoga. When I reached my third and current destination in the Czech Republic, I was feeling confident that I could attend a yoga class that was not taught in English. While I chose to attend a beginner’s class as my first class, and the whole time it felt like I was in an advanced class. I stuck with it, however, and every time I looked up to follow my teacher’s instructions and movements, she would just smile at me. There was definitely a language barrier between us, but the calm, kind way she spoke made me feel welcome in her class. I will always be the first person to recommend trying a local yoga class in a foreign country where you are unfamiliar with the language and culture. Whether you are advanced or a beginner, a yogi or yogini, doing so gives you a sense of motivation and self-appreciation. Whenever I practice yoga, I am able to lose myself in my asanas, and I experience this freedom whether in my own living room, or at a studio, in the company of other people who also love yoga. Don’t sweat. You are not the only person that has done it. Many people travel the world who have a love for yoga and want to practice while away from home. Don’t worry. Look around the classroom, most yogis and yoginis want to help you. Smile. It cures a frown and puts you at ease. Talk to your teacher before class. Introduce yourself as a new, foreign student with little or limited knowledge of their language. I usually ask them to use Sanskrit names for poses if possible because I am familiar with them. Go to a beginner class, even if you are not a beginner. Get a feel for the teacher and studio and see if you like it first before going deeper into the classes. Wherever you are in the world, yoga is yoga. Enjoy it and embrace the diversity in language and culture it offers.